While working outside today, I propped the PL-880 up on the tailgate of my truck and listened to some international broadcasters on shortwave. I then received a message from a reader asking if I would make a video of the PL-880 being tuned to CW (Morse Code). I switched the PL-880 into SSB mode and quickly found a “pileup” of CW operators around 14,035 kHz. In this video, I used the fine tuning control and the bandwidth selector to give you an idea how the PL-880 sounds in tight conditions. The bandwidth will narrow all the way to 500 Hz (.5 kHz)–a very respectable width for CW. While it doesn’t sounds as good as an amateur radio transceiver, it is certainly better than any other portable shortwave radio I own. Also, about halfway through the video an operator begins tuning up in the middle of the CW pileup (terrible manners! ); I used it as an opportunity for you to hear how smooth the PL-880’s 10 Hz steps sound as I move away from his signal. You’ll also note that I press and hold the number 6 and the display flashes “OFF.” I believe this is a noise reduction feature, but will need a little more time to experiment. 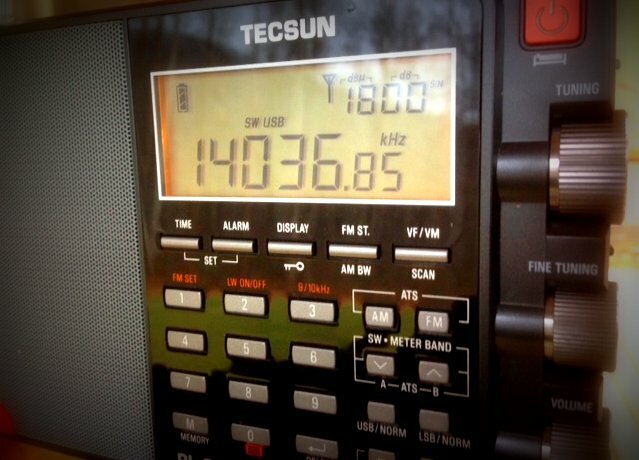 This entry was posted in Ham Radio, New Products, News, Radios and tagged PL-880, Tecsun, Tecsun PL-880, Tecsun PL-880 SSB CW, Tecsun PL-880 Videos on December 3, 2013 by Thomas. I haven’t seen that in a SW portable since the RS DX-400 / Uniden CR2021 from 1984. Is this receiver really as good as it looks on paper? Things are shaping up as I’d hoped they might. I’ve had two G3’s thus far and even though the performance has been great (though not as good as the 880 has shown thus far) both have had defects. Both with erratic behaviour when button pushing. Thankfully the second has been better than the first but not perfect. Needless to say I have high hopes for this little “joe” becoming my go everywhere unit. I don’t mind too much the lack of AA accomodation, if I do purchase one I’ll be buying a backup battery too. These days most of us go out with various bits of kit i.e. Phone, ipad etc. so those of us that do will only need to carry one USB charger. Thanks Thomas for al you’ve been able to give us thus far and thanks too to everyone else who has purchased and had input via the replies. One last note. I do like the case that it comes with and the map is a nice little bonus too. I think you’ll like the PL-880. It has quirks, too, but appears that almost everything can be adjusted by the user (huge plus). I’m doing my best to give it a run for its money this week! Do you mean that it will tuning in 10 Hz steps? I think that is what your display is showing. It can fine tune in 10Hz steps on SSB. How would you rate sensitivity / selectivity against the 660 on HF bands ? Patrick, that’s a good question and a tough one to answer. They are very close to one another. It’s hard to compare because the audio characteristics of the PL-880 are so different to that of the PL-660–at least, when using the built-in speaker. With headphones, there’s just not a lot of difference that I can note yet. Though I haven’t compared the PL-880 with the PL-660 on SSB, I think the PL-880 would come out on top. As you can hear in the video, it’s pretty sensitive and selective. Even when I lowered the whip all the way and took the PL-880 back in my house, I could *still* hear most of that pileup. I’ll know more in the coming days. Sure wish I still had a 909X in the house for comparison. Might have to see what I can do about that.